The purpose of this study was to examine the expression of Wnt pathway-related genes in patients with ulcerative colitis (UC). RNA from colonoscopic biopsies from noninflammatory bowel disease (non-IBD) subjects and UC patients were obtained and examined with a Wnt-specific microarray for the expression of Wnt pathway-related genes. Paired samples from uninflamed and inflamed areas of the colon were obtained for the UC patients. 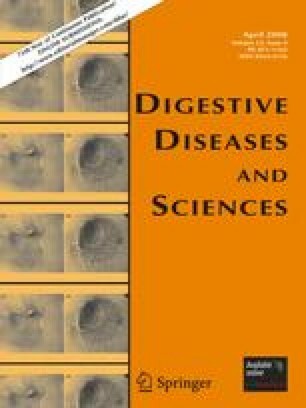 WNT2B, WNT3A, WNT5B, WNT6, WNT7A, WNT9A, and WNT11 exhibited significantly increased expression in UC compared to non-IBD patients. Frizzled 3 (FZD3) and FZD4 exhibited significantly increased expression, and FZD1 and FZD5 exhibited significantly decreased expression in UC patients. Genes with increased expression in inflamed mucosa included DKK4, DVL2, SOX17, and COL1A1. There was no difference in the expression of a panel of Wnt target genes. The expression of inducible nitric oxide synthase (INOS) was variably influenced by inflammation. Significant differences in extracellular and cell-surface components of the Wnt pathway exist in the colonic mucosa of patients with UC compared with non-IBD patients, which may influence the strength or specificity of Wnt signaling. In inflammation, inhibitory components of the Wnt pathway exhibit increased expression, but no changes in Wnt pathway target gene expression are seen. The role and complex regulation of Sox17 and iNOS in IBD warrant further investigation. Author contributions: Dr. You and Dr. Nguyen performed microarray experiments and analysis; Dr. Albers participated in tissue acquisition; Dr. Lin provided pathological review of all samples; Dr. Holcombe provided oversight and direction for all aspects of the research. The authors thank Dr. Kestus Planutis and Dr. Chris Hope for their advice on experimental methodologies. This work supported by NIH grant DK-65642 (RFH) and a grant from the Broad Medical Research Foundation (IBD-0065R, RFH).